We would first like to apologize to everyone for how cryptic our previous statement was. We felt there was a need to inform everyone that we have spoken to the club since our first statement. The club did agree to chat with us, but unfortunately there was much of the conversation that we can not disclose due to our Stateside Jacks agreement with the club. We would like to clarify the following before we continue; The Swans Trust was aware of the conversation that would be held between Stateside Jacks and the board. Stateside Jacks does not have any equity in the club nor plans to acquire any equity in the future. We are strictly a supporter group for the club created by fans of the club who happen to live in America, Swansea expats and Americans alike. There were no negotiations during this conversation because it was nothing more than a discussion about our frustrations with the current dealings of Swansea City AFC. While we are not at liberty to disclose all of our questions/comments and responses, there are a few things we can disclose. After our initial post, there was a large amount of frustrated comments and slander thrown towards Stateside Jacks as well as personal threats, which is unacceptable behavior in general. Everything we do is out of love for the club, we have not earned, nor will earn a penny from our association with the Swans. 3. We expressed our desire for the club to be more transparent with the Swansea fanbase regarding their current financial status and transfer decisions. We want to assure each of you that the we are doing everything that we can from this side of the pond. While we do not have a stake in the club like the Trust, we just didn’t feel right sitting by doing nothing while the trust fights the good fight. We all want the same thing, which is for Swansea to go back to “The Swansea Way”. The club does wish to work with us as well as the other supporter groups in order to build a relationship of honesty, understanding and trust. As always it is the Stateside Jacks committee’s responsibility to represent the voice of its member base, in doing so we will be as transparent as we can on the outcome of our discussions with the caveat that we will not be able to disclose any information that we consider as private. We are pleased to confirm that during the past week the Stateside Jacks committee in its capacity as an Official International Supporters club convened a meeting with both the majority shareholder group and a representative of senior management of Swansea City football club. At that meeting the Stateside Jacks committee was able to fully represent and appropriately discuss a wide range of concerns on behalf of its member base. While the outcome of the discussion leaves us with some elements of unresolved concerns for the future of Swansea City football club, we are pleased to announce that we have opened an official channel of communication with club ownership which both parties have agreed to explore further. While we feel it is in the best interests of both the Stateside Jacks Official International Supporters and Swansea City football club that the details of this week’s discussion remain private, we can confirm that the Stateside Jacks committee has been asked by the shareholder group and senior management to consider voluntary collaboration with the club in an official supporter’s advisory capacity. We want to assure each of you that the shareholder group has heard your concerns and that they wish to work with us in order to build a relationship of honesty, understanding and trust. As always it is the Stateside Jacks committee’s responsibility to represent the voice of its member base, in doing so we will be as transparent as we can on the outcome of our discussions with the caveat that we will not be able to disclose any information that the club has requested we retain as private. 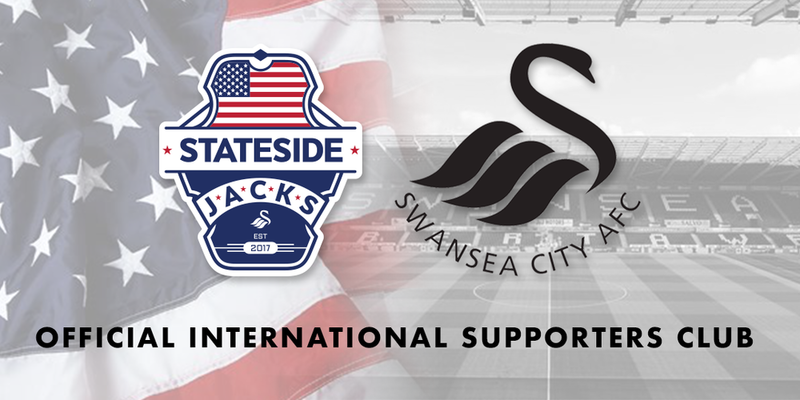 In light of recent and on-going events at Swansea City Football Club, the Stateside Jacks committee is presently in contact with the majority shareholders of the club to outline in specific detail its main areas of concern as an official International Supporters club. At this time, we believe it prudent that we do not disclose the stated areas of concern in order to provide the majority shareholders with an opportunity to respond. With that being said, we have taken all comments of concern received from our member base and have communicated those directly to the club hierarchy. In doing so we have also requested an immediate meeting to be convened between Swansea City football club’s majority shareholders, Swansea City supporters trust, club partners/sponsors and official domestic/international supporter’s clubs. The Stateside Jacks committee want to assure each of you that it’s goal is to represent the voice of its member base and in doing so will act in an appropriate manner with the aim to help safeguard the welfare and future of Swansea City football club, its local community and various official supporters clubs. Rodon. James. Roberts. All Welsh, all under 25. Graham Potter’s young dragons have provided a much-needed spark for Swansea City as of late. From Daniel James’s finesse passes, to Joe Rodon’s stalwart defense, and with Connor Roberts flying all over the pitch, Swansea have developed an amazing young trio poised to make it big in the Championship. While transfers have undoubtedly left supporters with a sour feeling, the home-grown academy players are thriving in the English Championship, and taking the world by force as part of the Wales National Team. Connor Roberts, hailing from Neath, has waited patiently in the academy ranks for his first team call up. A key figure in the U23s cup run, Roberts made his initial debut for the first team in the 2017-2018 FA cup tie against Wolves, eventually being a regular for the remainder of the Premier League campaign. Now in the Championship, Roberts has shown to be a spark plug, creeping up from the right back to punish on counters. Roberts has made 6 caps for Wales and scored an absolute screamer off a Gareth Bale assist against Ireland in the UEFA Nations League. Joe Rodon, from Morriston, also bided his time in the academy for over 10 years before receiving his first senior call up against Preston North End in August. With a squad so thin in numbers, Rodon has proved to be an unwavering defender and a key member in a Swansea defense that has let up the 2nd fewest goals in the Championship. Joe made his senior call up this October and will play a key role in the UEFA Nations League campaign for Wales. Daniel James showed the Championship just how much grit he had in Swansea’s defeat of Reading in October. James both forced a penalty and dished out a beautiful assist to Oli McBurnie to give the Swans a 2-0 win. James, joined Swansea in 2014 from Hull City’s academy. He also developed in the Swansea academy, helping the U23s to their cup. James made his debut for the first team against Birmingham City and has since played like an absolute madman terrorizing defenders on the pitch. James recently made his first senior call up for the Wales national team against Serbia. The three young dragons have showed the supporters just what they are capable of on the pitch. Welsh born and homegrown in the Swansea academy, they are a testament to the grit and determination of Swansea, and Wales as a whole. Our academy is shaping up to be a goldmine that we have unknowingly squatted on for too long. It is time to stop burning money on lavish transfers, and time to start investing in our product to lock them down for a successful future. @SanDiegoSwans and head over to the brewery to catch a match! How did you guys first begin to follow Swansea? community, so I decided to support my Welsh heritage and they’ve been my team ever since. When did your group first start to meet up? Shelly: I met Karl and Paul 1 year ago, before that I yelled at my TV alone. How many members do you currently have? you describe what you have done? Where do you meet up on match day? Karl:Thr3e Punk Ales is our home spot. They’ve always been incredible hosts opening early for us. Does your group do any other activities outside of watching matches together? Drinking the dankiest of craft beers and pickup matches! How can Swans fans in the area get in contact with you to join a meet up? What is your prediction for this year in the Championship? Shelly: We have to find the back of the net, but if we can I think 6-8.